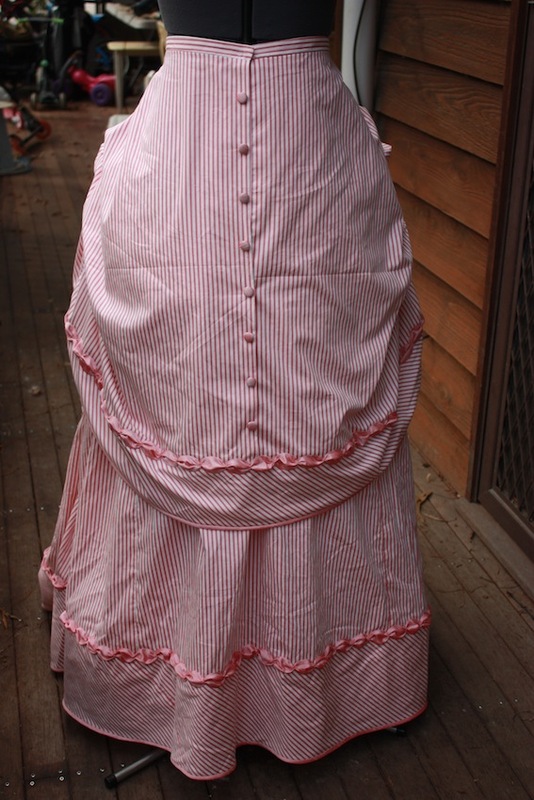 An 1880’s petticoat, worn over a bustle. From The Metropolitan Museum of Art. 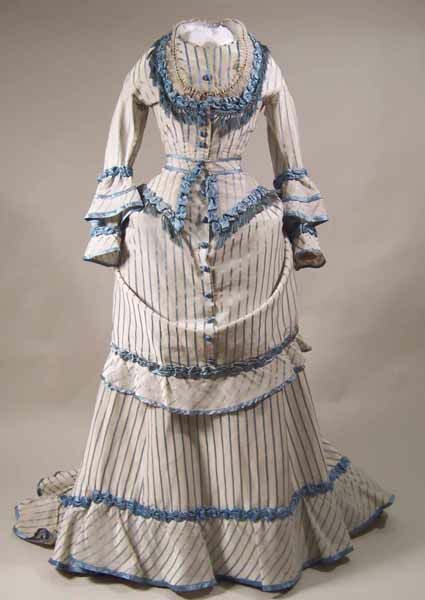 Another one of the numerous undergarments worn by the Victorians were petticoats, and – depending on the particular decade of the 19th century – there could be many layers of them. 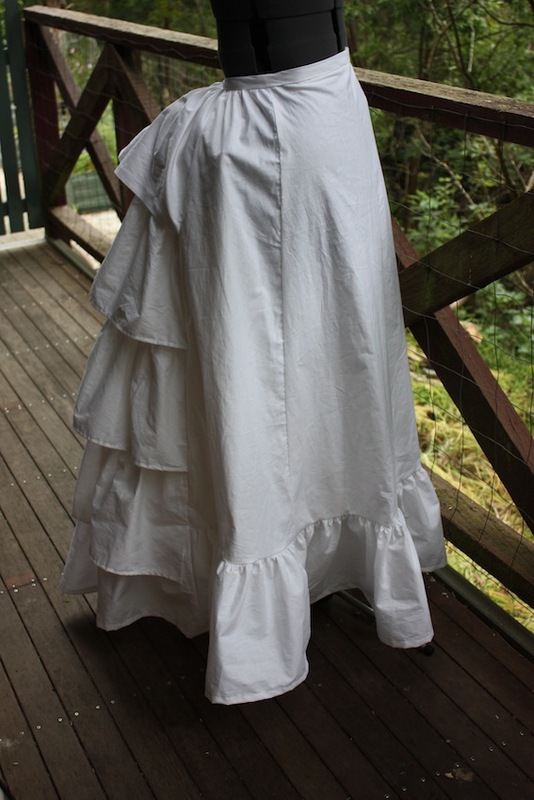 I needed to make a petticoat that was worn with a bustle, generally made with layers of frills to soften the line of the cage-like structure underneath. 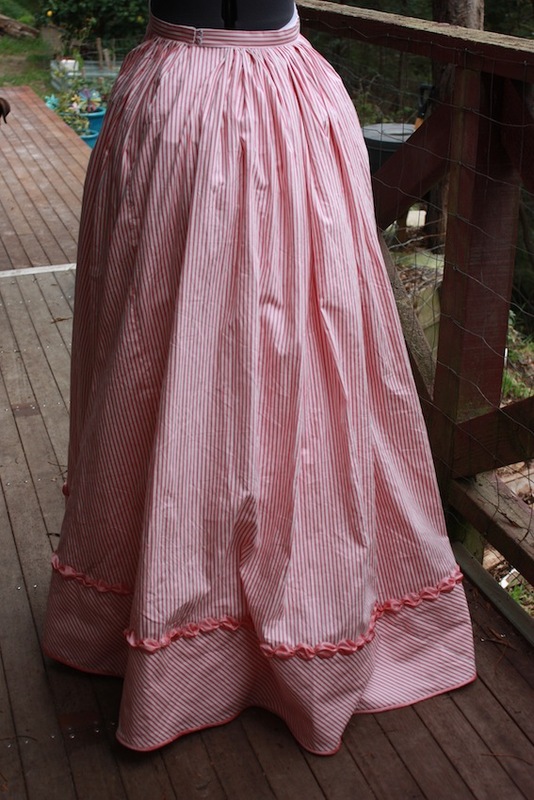 As my bustle was most similar to those worn in the 1880’s, it was no surprise that the petticoats that really suited my purpose were ones from the 1880’s. The one I really liked is pictured to the left, with small flounces to add body and pretty lace that could peep out the bottom of the dress. It was really unfortunate that I had so little time to incorporate any of this into my own petticoat, but I had only two days to make mine! 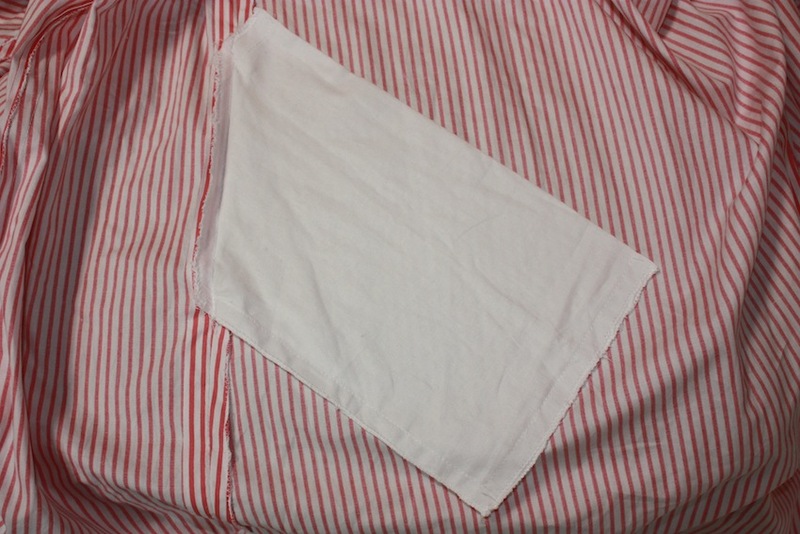 My fabric choice was a white cotton broadcloth, 4 metres in length. 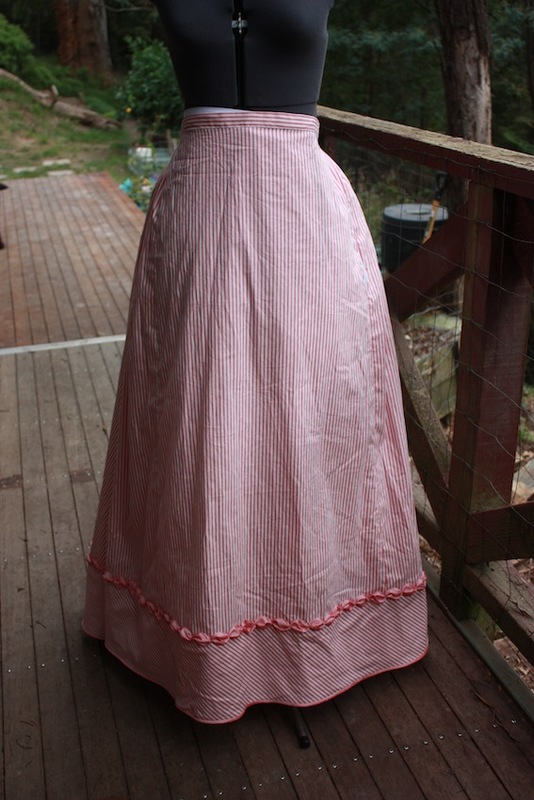 I made my own pattern from the picture above, using the measurements of myself and my bustle as a guide for size. 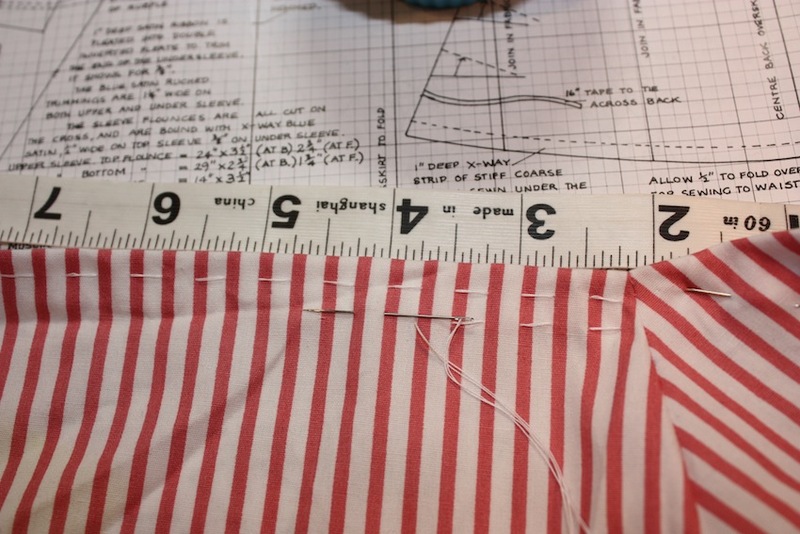 Using these measurements, measure out the pattern pieces on the fabric. The waist-to-floor measurements should correspond to the length of the pieces (minus the depth of your intended bottommost frill). 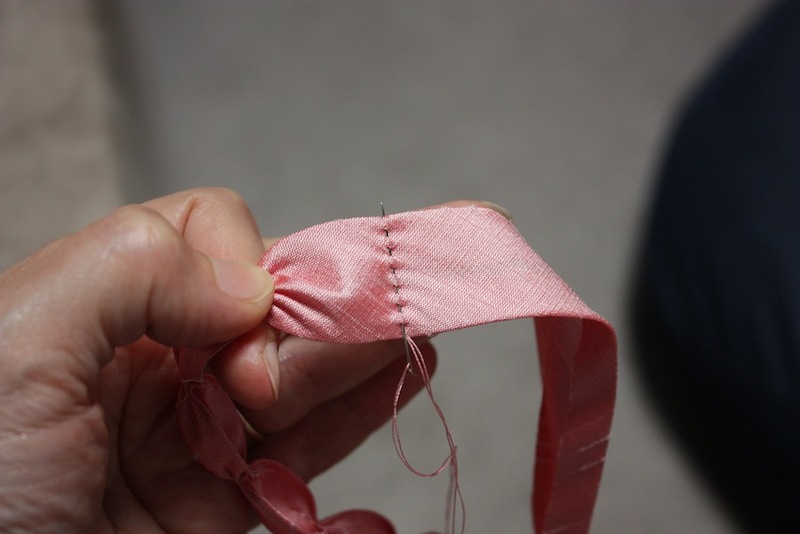 The front area of the petticoat at the waist is not gathered so the front and side pieces (on the top edge) together should measure the same as the front part of your waist (or a bit further around). 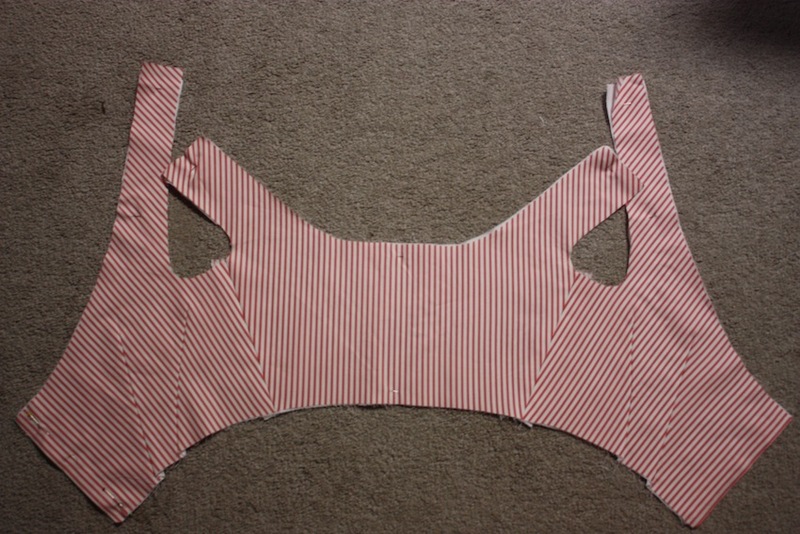 The back area is gathered, so the top edge of the back panel should be double this part of your waist. Add seam allowances too! Frills for back panel (10″ deep, plus seam allowances) Each frill should be roughly double the length of the line (across the back panel) that it will be sewn on. I tried to cut these frills against the selvedge. These are my panels; (from left to right) front, side and back. Step One: Sew the front panel to the side panels, neatening seam edges. Step Two: Hem one long edge of each section of frill (those frills that are for the back panel) and gather the other edge (I gathered the selvedge edge to avoid neatening it). Attach the frills to the back panel, one at a time, by sewing it on top of the back panel, through all layers. 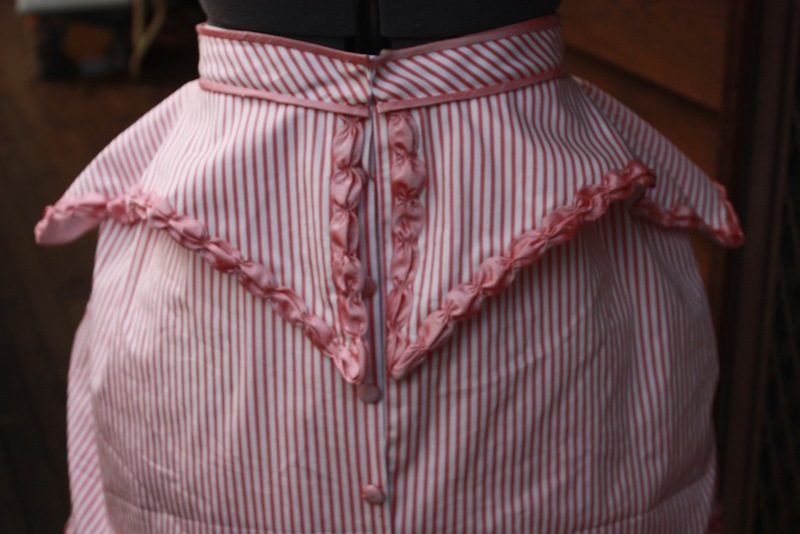 The first frill is attached along the upper edge of the back panel. 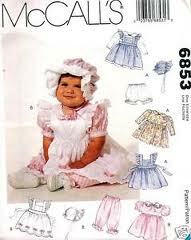 Each frill is roughly twice as long as the section it is sewn to. 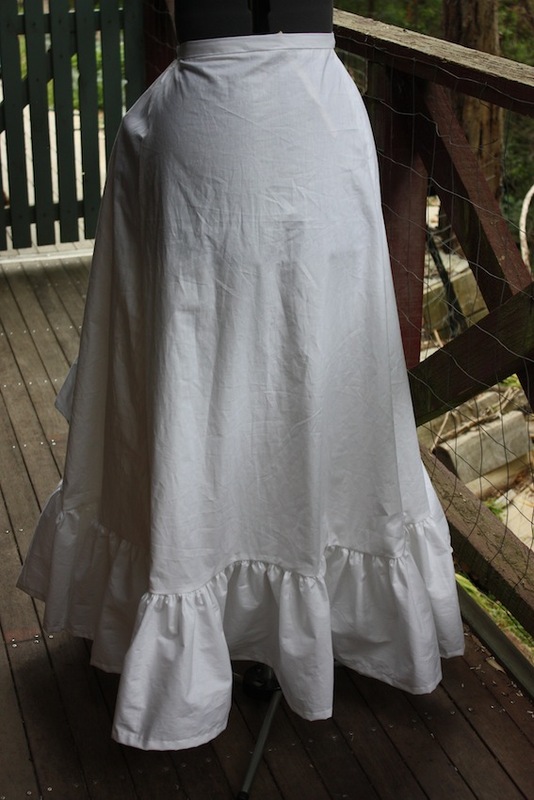 The bottom frill is attached along the bottom of the back panel. 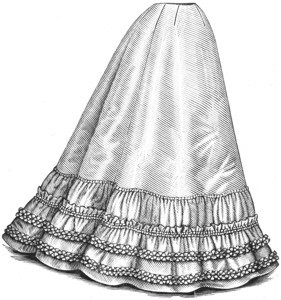 The bottom edge of the frill reaches slightly below the bottom edge of the petticoat. 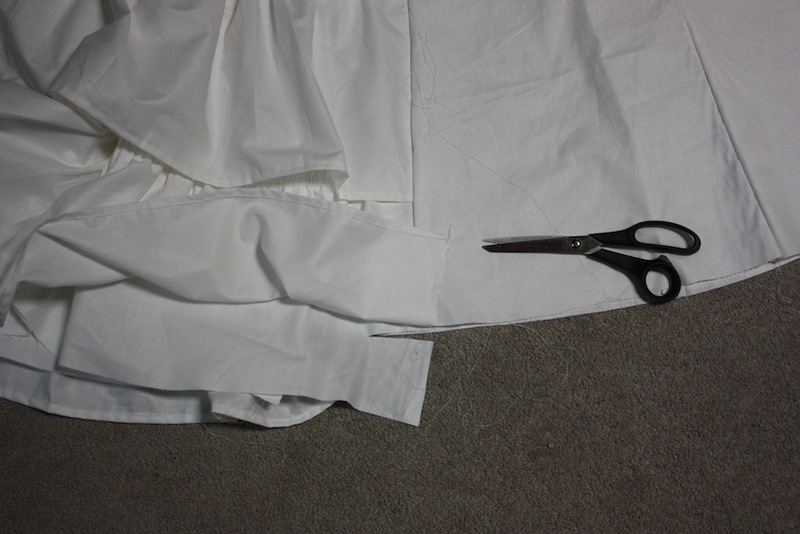 Start with attaching the first frill along the top edge of the back petticoat panel and then do the bottom frill. 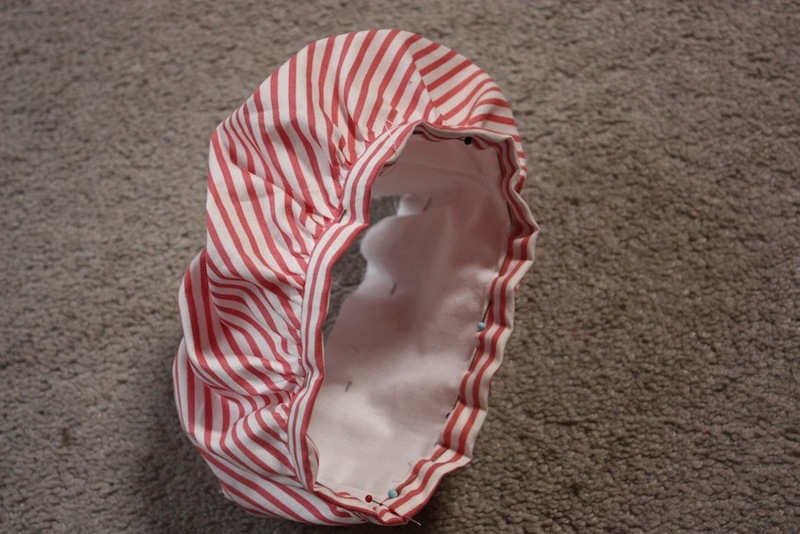 Then you can space the other frills in between. 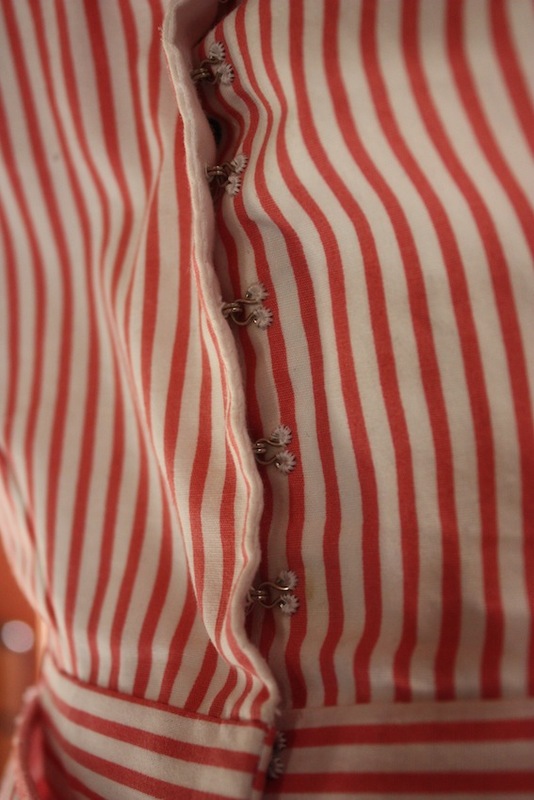 There should be an inch or two overlap where the upper frill falls over the one under it. 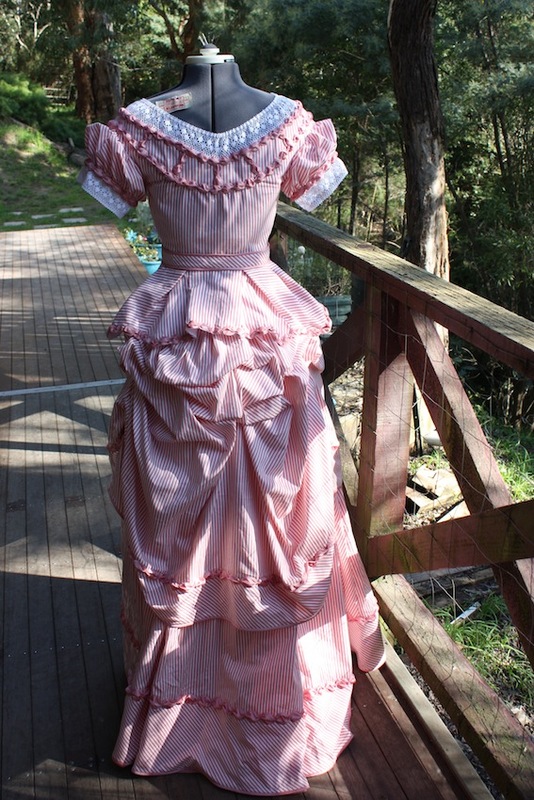 I had a total of four frills on the back panel. Step Three: Pinning the edges of the frill to the edge of the back panel, sew the back panel to the side panel (making sure you catch the frill edges in the seam). Step Four: Make sure the bottom edges of the petticoat are even. Trim off any excess if needed. You will notice that a little part of the last frill (in the side seam) is raw, and this was hemmed by turning under and sewing. The frill at the bottom of the back panel is lifted up, and you can see where I am trimming the bottom edge of the petticoat. 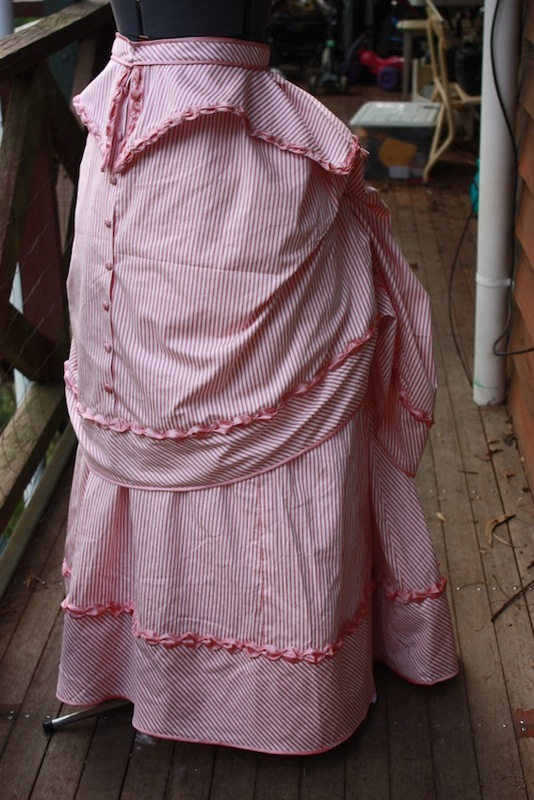 This is because I made the back panel much longer than the front panels so it would go over the bustle. Step Five: Hem one long edge of the bottom frill and gather the other long edge (in small manageable sections). This gathered edge will be caught in a seam so I used a raw edge (rather than a selvedge edge as I did in the back panel frills). Step Six: Attach the frill to the bottom edge of the petticoat. 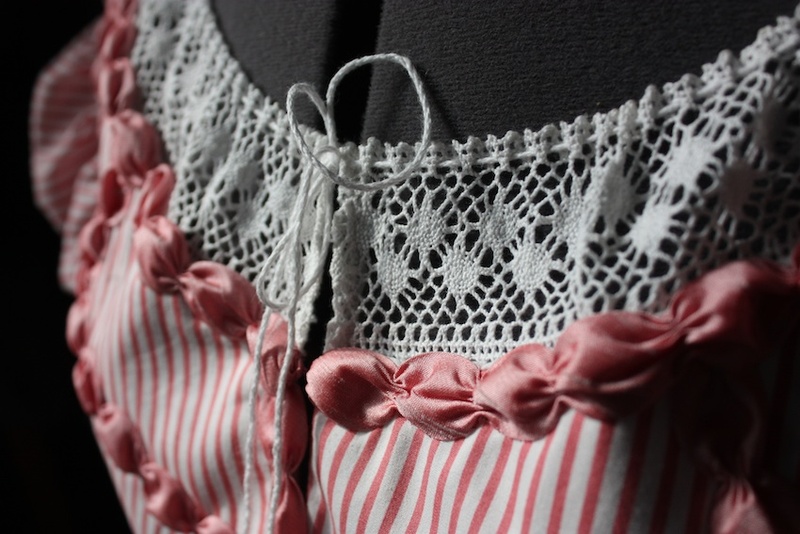 You will notice that a small part of the side seams will need to be unpicked (where the back frills are sewn into the side seam) at this stage so that the bottom frill can go around neatly. 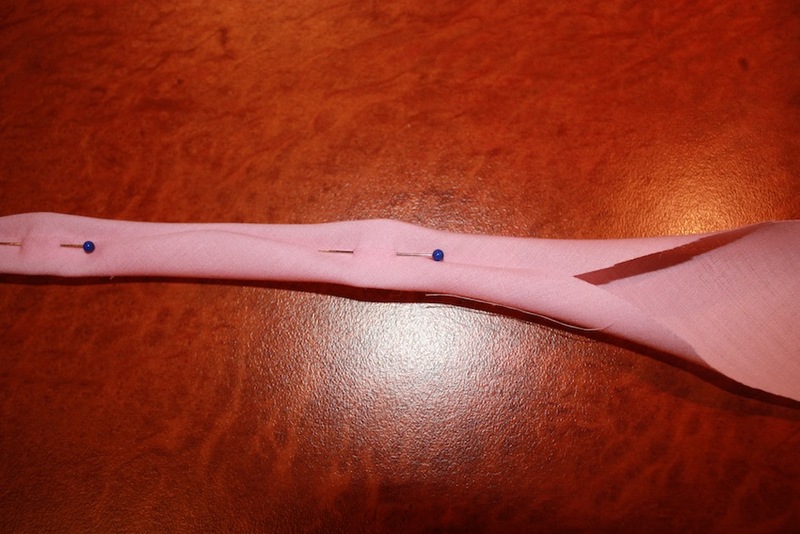 You may need to resew (or hand sew) these parts afterwards so they sit properly again. Step Seven: Gather the top edge of the back and side panels. 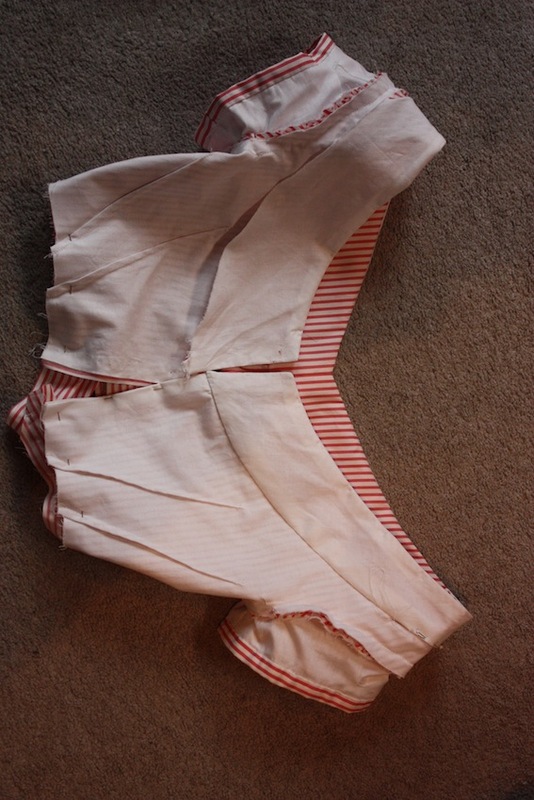 Attach the waistband in the normal manner, adjusting the gathers to fit. 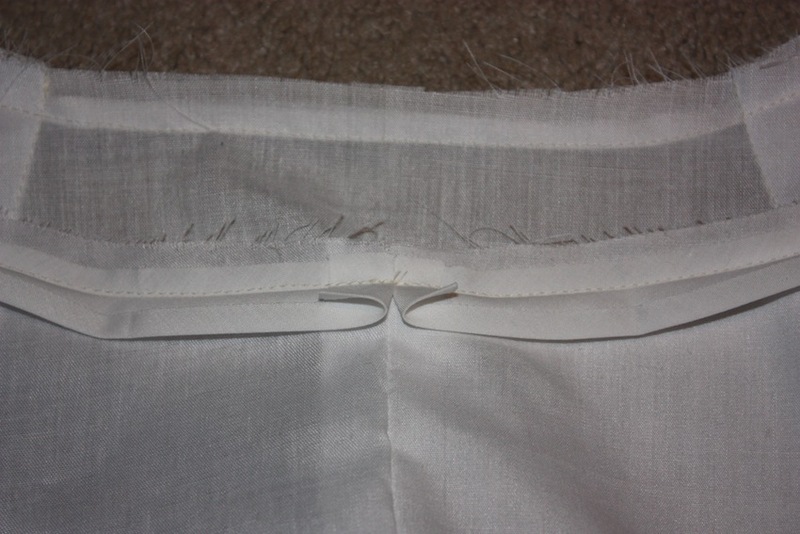 Note: Because I had sewn all the seams closed, I needed to make a placket in the left side front seam. 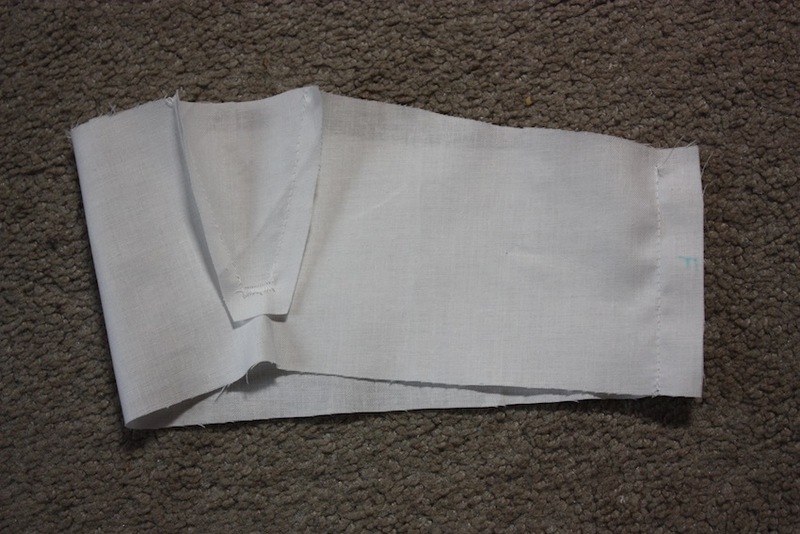 I just sewed (top-stitched) the seam allowance open, reinforcing it at the bottom of the placket, and then unpicked the seam. 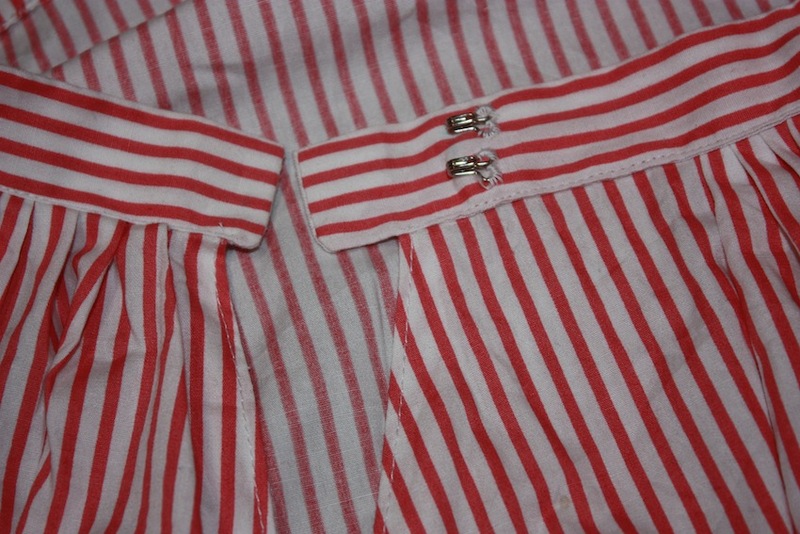 I used a pair of hooks and eyes for a closure, but a button or waistband hook and eye would work too. 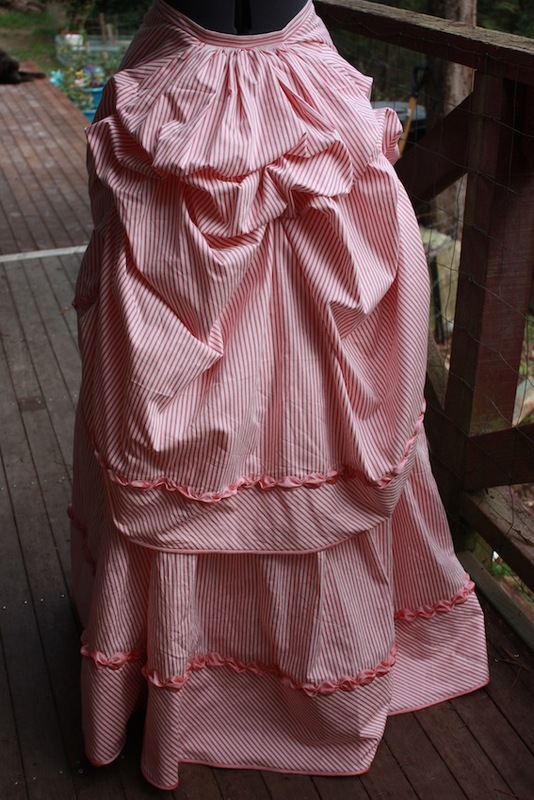 The side view, with the bustle underneath. All finished! And I really like it! 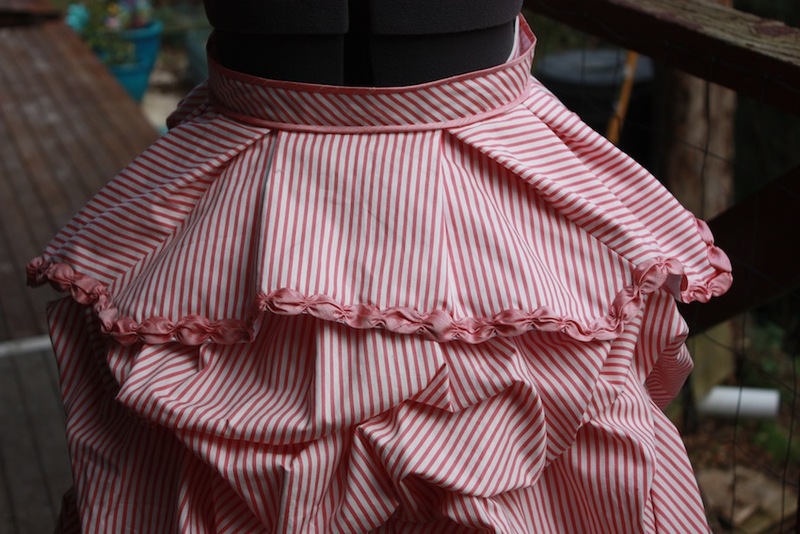 One very handy thing is that, if it happens to be too long, you can take a few horizontal tucks around the bottom frill to raise the bottom edge, as it was done in the extant garment pictured above. Mine is slightly longer at the back, but not enough to trip on when I am dancing. 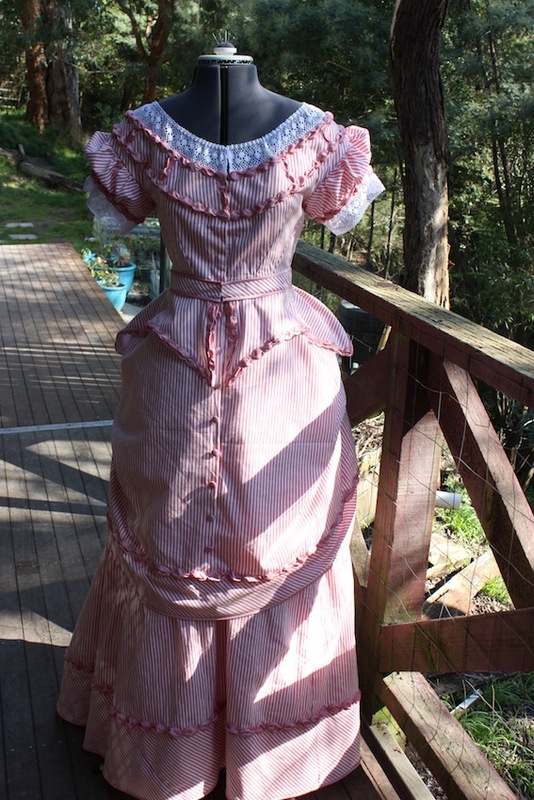 My next item in my Victorian wardrobe is an early 1870’s gown. – coming soon! 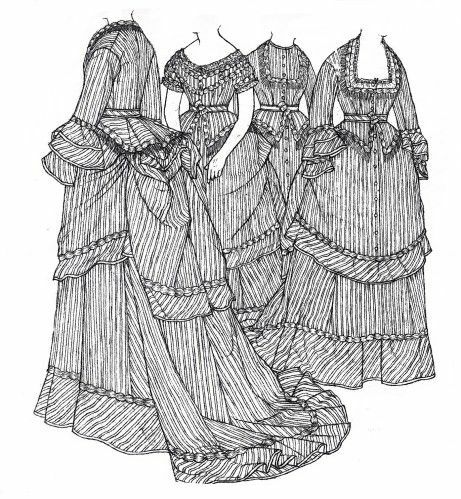 In the late Victorian period the large bustles underneath the skirts gave way to the long, flowing lines that preceded the Edwardian period. The skirts of this period were close-fitting around the waist and very A-line in the front, but they fanned out to be quite full at the back of the dress. 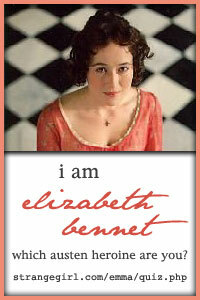 In order to support the shape of the skirt, a petticoat was required that could hold this quite definite A-line angle. There were several different types of petticoats worn during this era, but I was particularly interested in the gored petticoat. A gored petticoat, c. 1896. 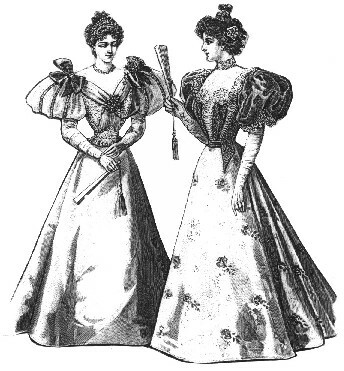 The Delineator magazine published a pattern for a gored petticoat in June, 1896. 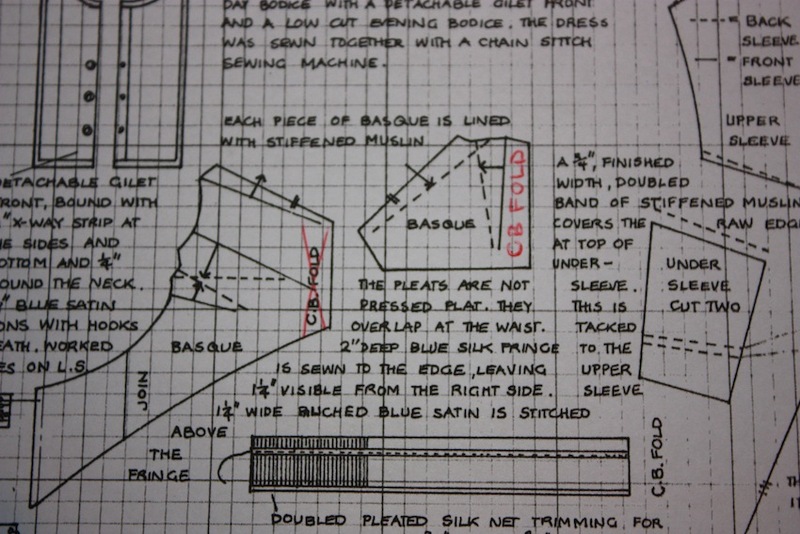 I have not been able to find the original article online, but Dressmaking Research has been kind enough to reproduce the pattern instructions, which I am very grateful and have found very helpful! 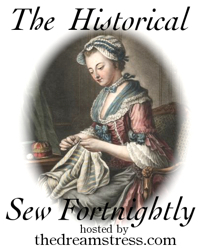 For this reason, I have decided to do this petticoat for the Historical Sew Fortnightly Challenge #23: Generosity and Gratitude. 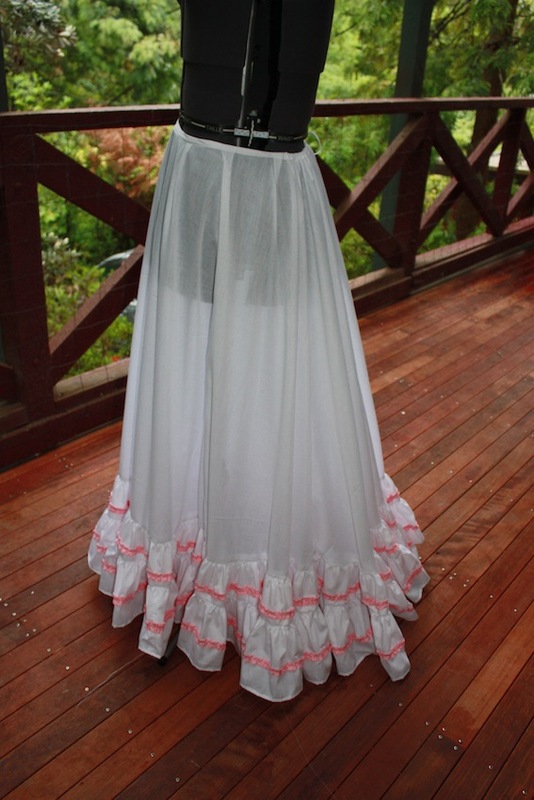 The skirt consists of a front-gore, two gores at each side and a back-breadth. 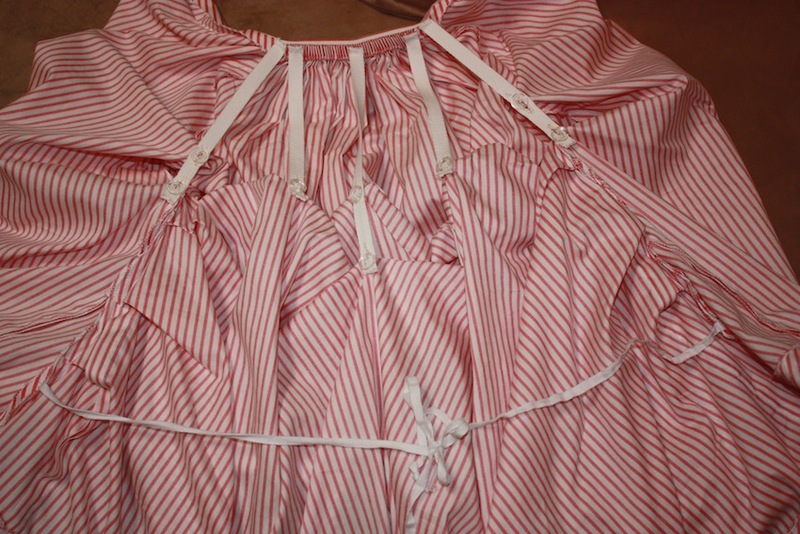 The top of the petticoat is finished with an under-facing, which forms a casing for tapes that are tacked [to the] back of the darts in the side-gores and drawn out through openings made at the center of the back, thus regulating the fullness about the waist and avoiding the need of a placket. The [top] flounce is ornamented by a deep, bias trimming flounce that is turned under at the top to form a self-heading and shirred on cords at the top and hemmed narrowly at the bottom; the trimming flounce is decorated with two silk ruchings, the whole arrangement increasing the flaring effect and making quite an elaborate foot-trimming. 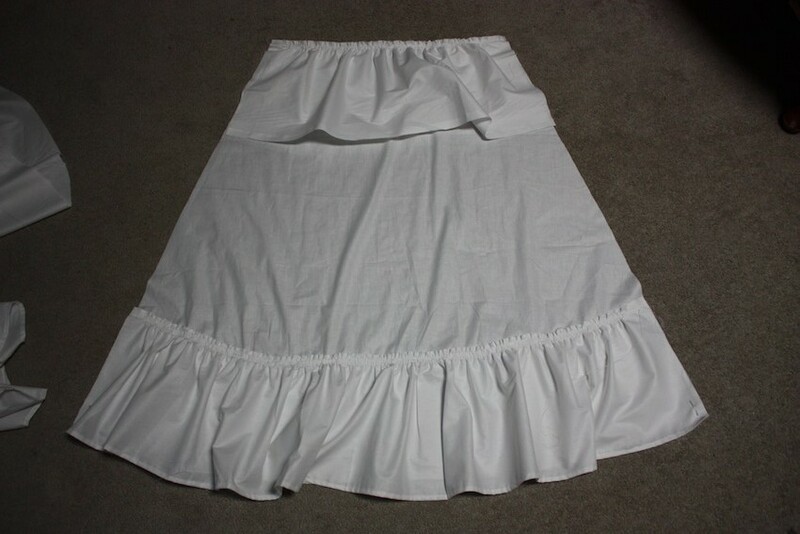 To make the petticoat-skirt with the trimming flounce for a lady of medium size, will need twelve yards of material twenty inches wide, or eight yards and an eighth twenty-seven inches wide, or seven yards and a fourth thirty-six inches wide. 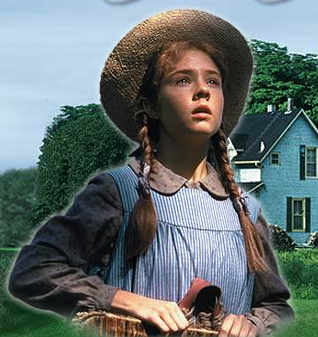 Jeepers! That’s a lot for a petticoat! No wonder the war changed the yardage available for women’s fashions. 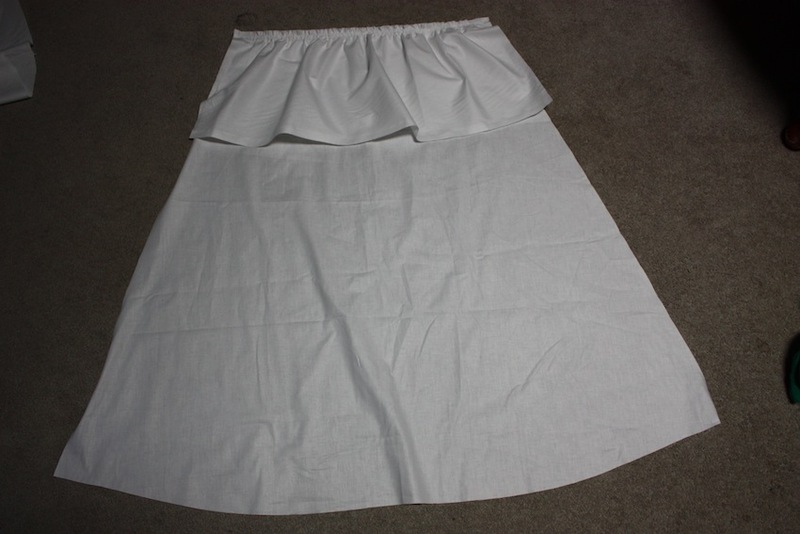 There are three pieces to the skirt; the front (cut on the fold), the side (cut two), and the back (cut two). Gored skirt panels always have the “front edge” cut on the grain, with the other “bias” side pointing to the back. In this case, the centre front fold runs with the grainline and the side gores have the front edge on the grain. For the back panel, the centre back runs with the grainline. The two measurements that need to be taken are your waist measurement and waist-to-floor (length) measurement. 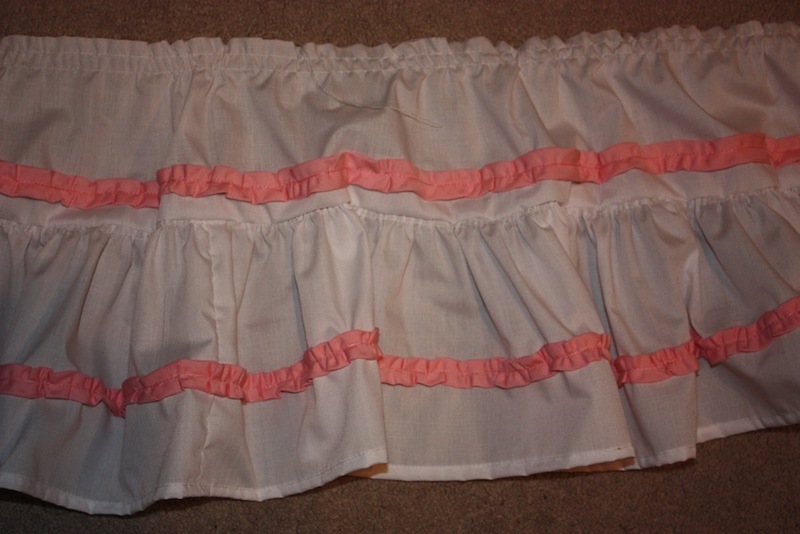 The skirt panels plus the added length of the two rows of ruffles need to equal the waist-to-floor measurement. 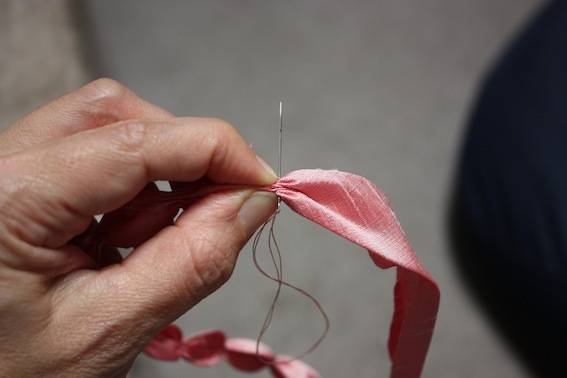 In order to make sure the finished petticoat fits your waist correctly, the waistline of both the front and side panels should each measure 1/6 of your waist measurement. Because these panels are doubled over on the material, they should make up for 2/3 of the waist measurement (1/3 each), leaving the last 1/3 for the back panel. 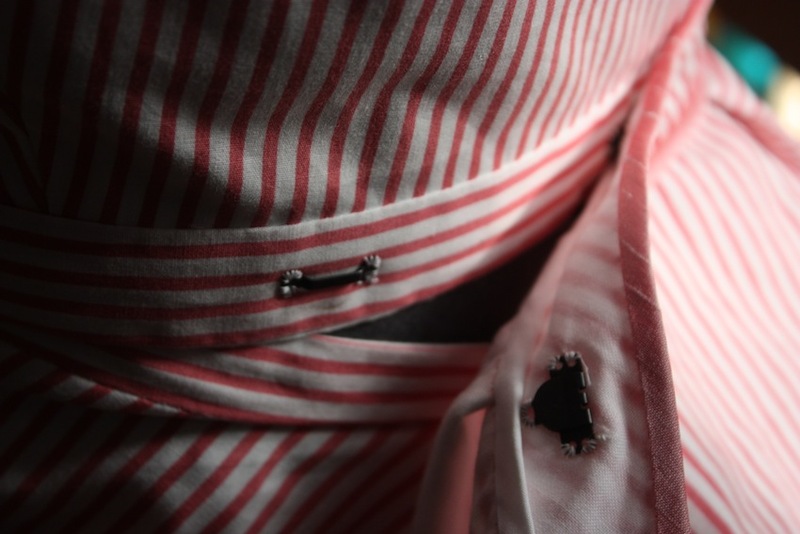 As the back panel will be gathered in with ties, the waistline of this panel should measure 1/3 of your waist measurement (which is double what it needs to be, but allows the extra to be gathered in at the back). 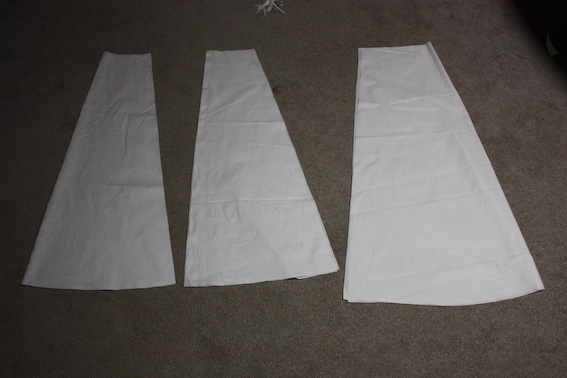 The pieces cut out and laid out as they will be sewn; (from left to right) front, side, back. The only thing I would change to the skirt if I did it again is that I would make the front and side gores a bit more narrow and less full around the bottom edge. 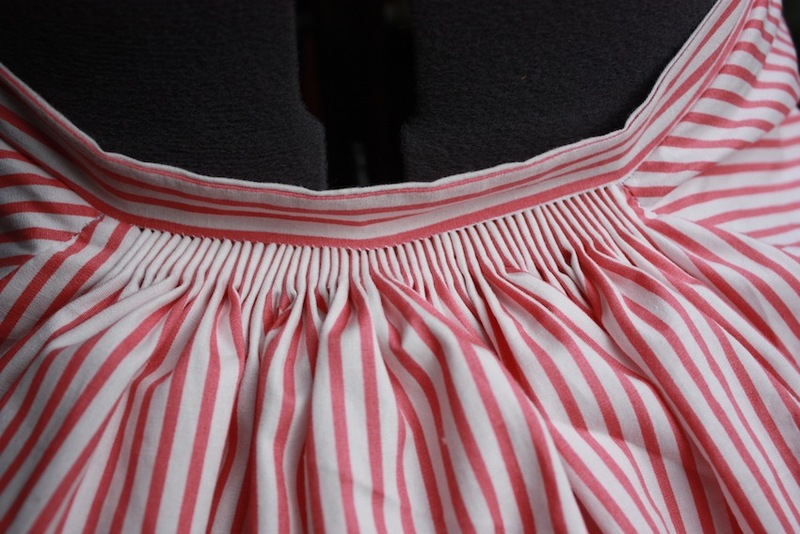 The first row of ruffles were cut to be 10 cm deep and twice the length of the bottom edge of the skirt. 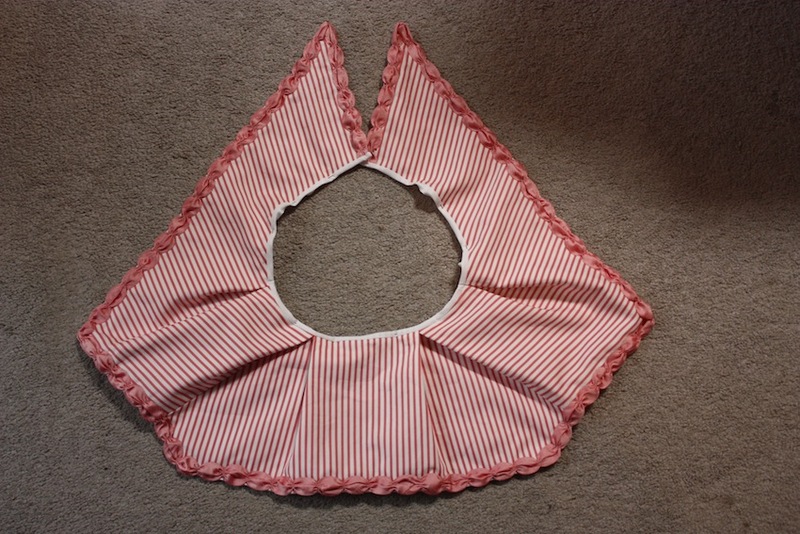 The second row of ruffles were cut to be 15 cm deep and twice the length of the first row of ruffles. I did not make my ruffles on the bias as the pattern suggested, but ran them perpendicular to the grainline (mainly to conserve fabric). 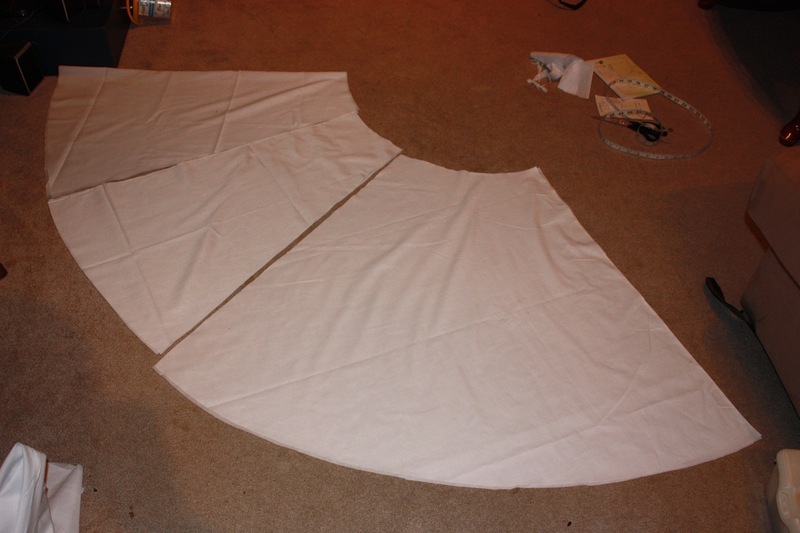 Step One: The skirt panels were sewn together; front to side, side to back, and centre back seams. Darts were sewn in the front and side panels to fit them around the waist. 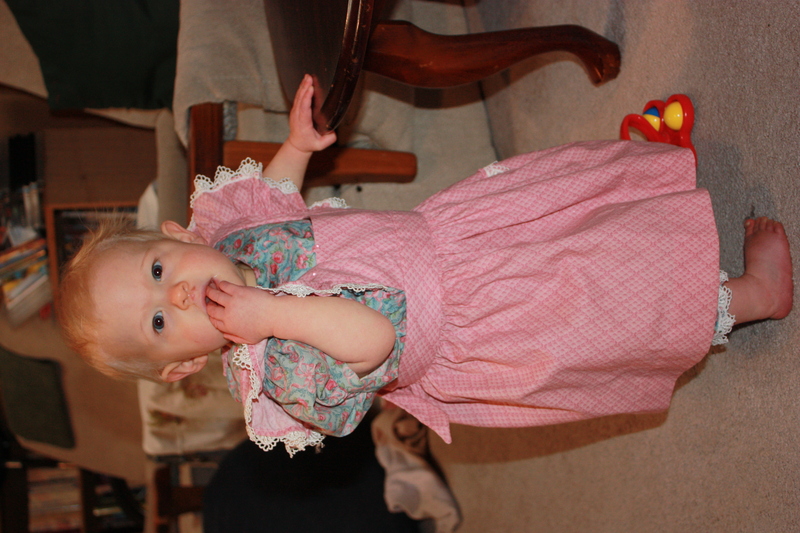 Step Two: The ruffles were sewn together to form long lengths, which were then sewn with gathering stitch. 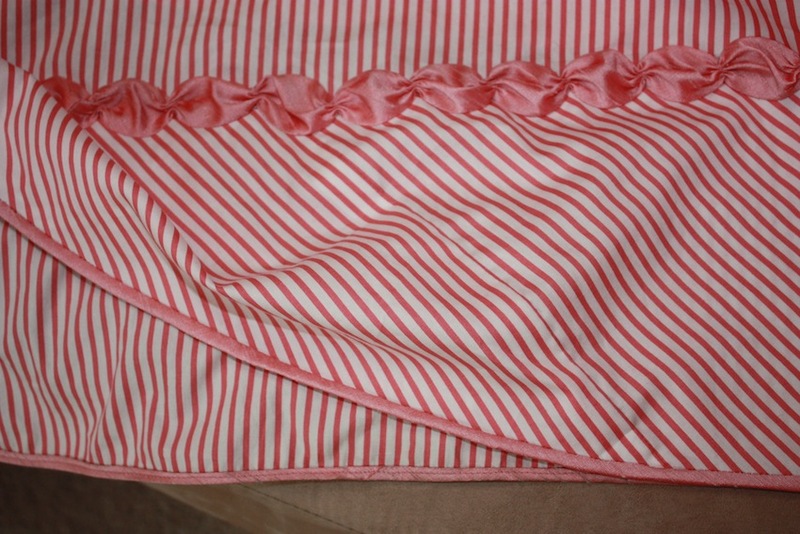 I also hemmed the bottom ruffle to save doing it later. 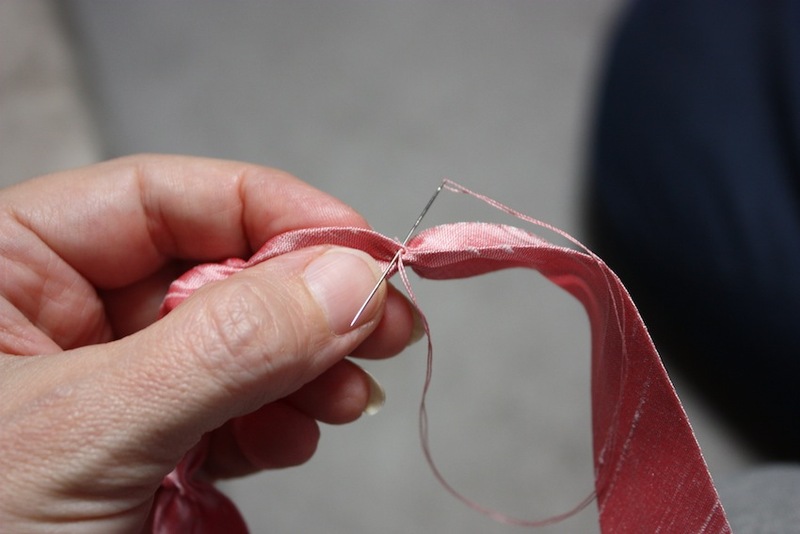 Hint: Sew the gathering stitches on the ruffles in sections. Smaller sections of gathering will reduce the likelihood of breaking the threads and make it easier to make the gathers even. 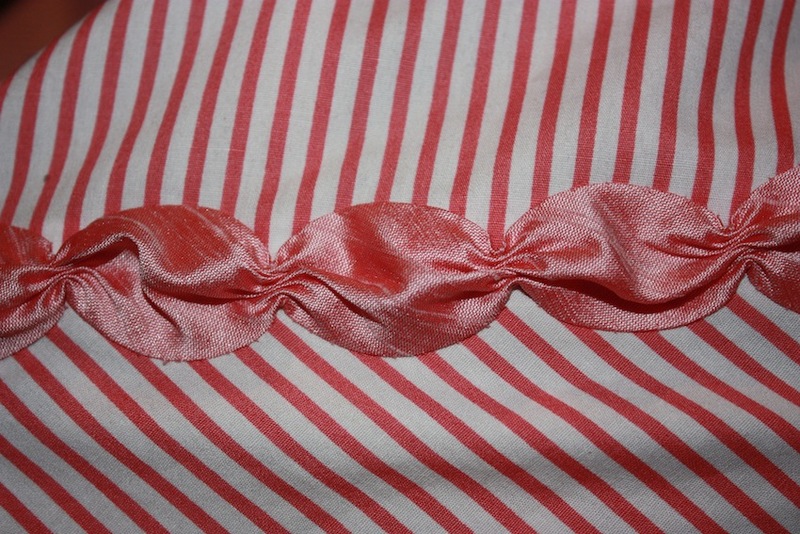 Another Hint: Don’t gather the ruffles until you have sewn the ruching on, as it is easier to work with flat material. Step Three: The ruching was made from bias strips with the raw edges turned under. 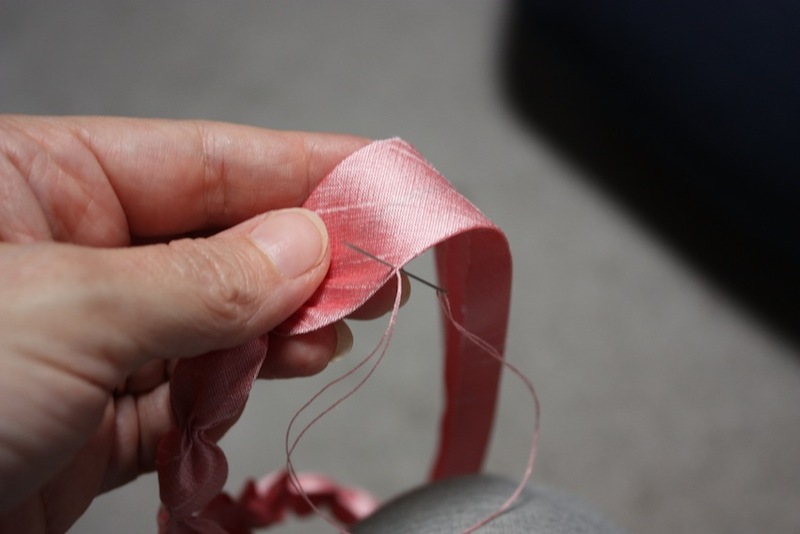 A gathering stitch was then sewn down the centre through all thicknesses. 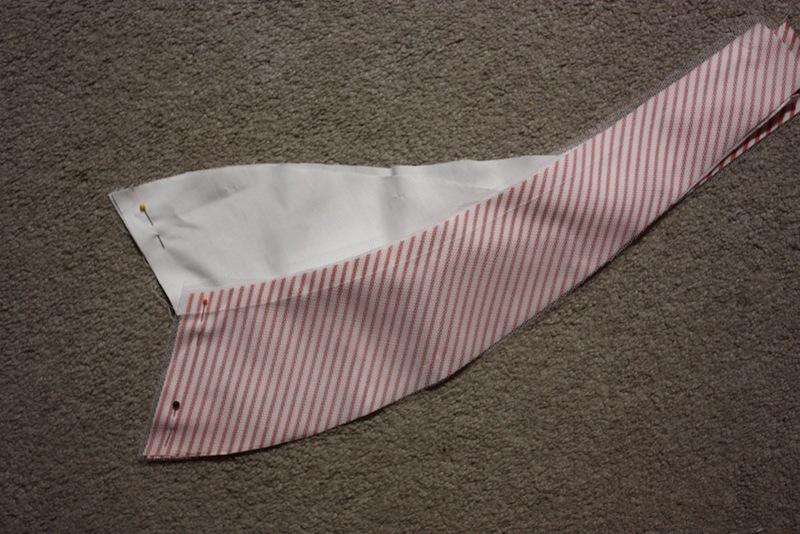 The strip could then be gathered and stitched down in place on the ruffle. Once again, the gathering stitches should be sewn in smaller sections as it makes it more manageable to gather and attach it to the ruffle. The raw edges of the bias strip are turned in and under before being sewn with a gathering stitch. 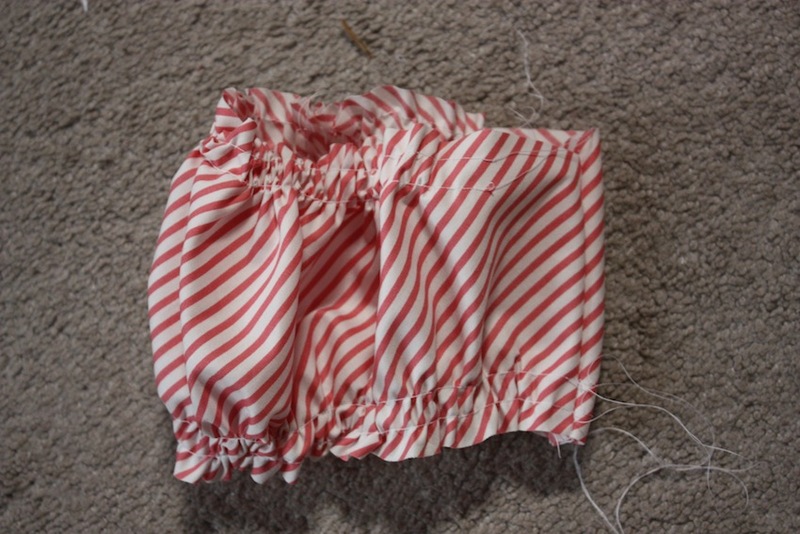 The finished frill with a row of ruching on each row of ruffle. 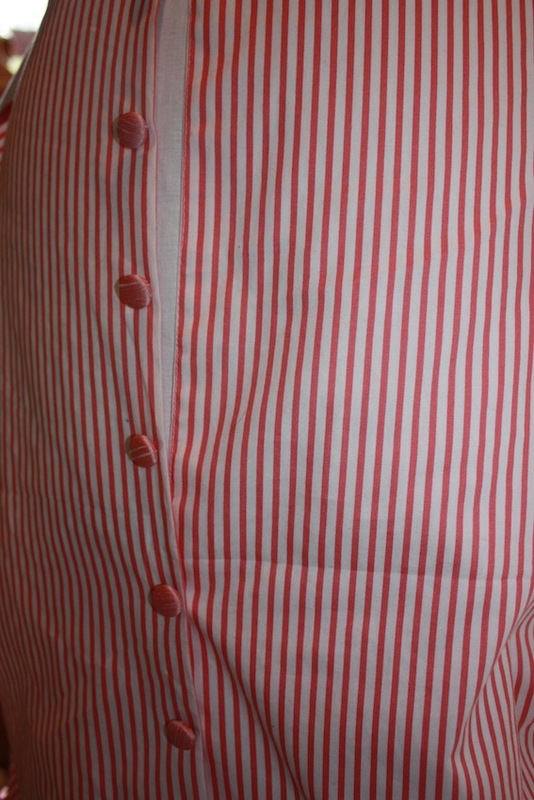 Step Four: A strip of bias binding was sewn around the waistline. This was then turned to the inside and sewn down to form a casing for the waist ties. The bias binding sewn onto the waist edge. The ties will come out through the seam in the centre back. I used cotton tape for the waist ties, anchoring them at the darts in the side panel and then threading them through the centre back seam. They could then be drawn up to fit the waist. 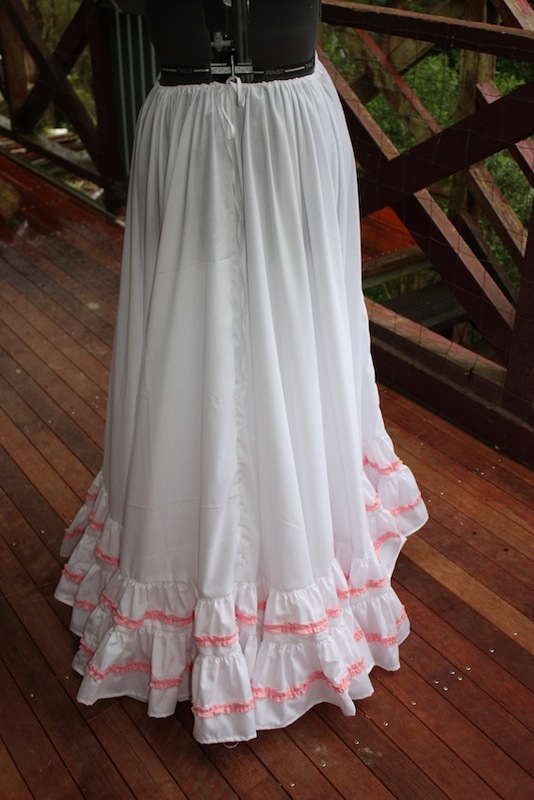 This petticoat was just made with a plain poly-cotton which I found on sale cheap at my local fabric store. It took about 24 hours to make it in total, as it took ages to gather up all those ruffles! It cost roughly $18 AUD to make. And now for the finished article. Often petticoats of this era were made with silk and were trimmed elaborately. 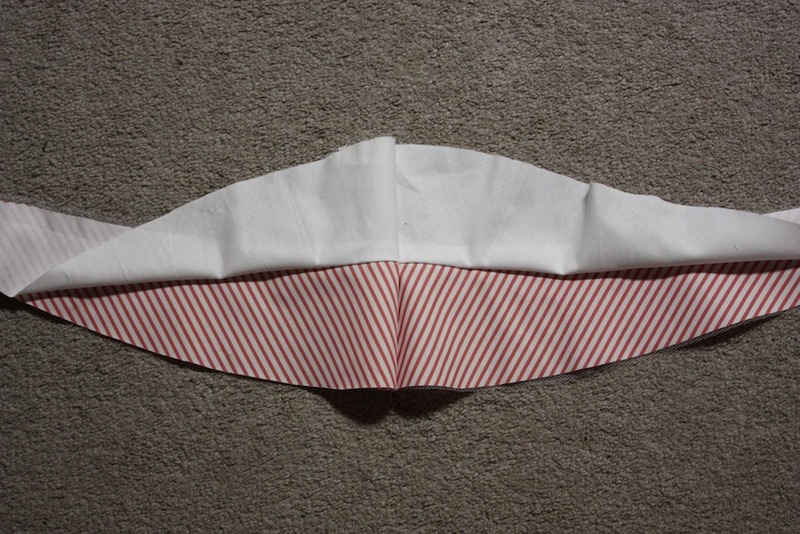 However, mine serves the purpose – as a functional undergarment for a 1890’s fan skirt.